Lighthouse & Telegraph Station. See Events for opening times. Today marks the 150th anniversary of the last Confederate raider’s formal surrender, which took place in the Sloyne off Rock Ferry. I imagine you’d have had a good view of the ceremony from Bidston Hill. Shenandoah would have been alongside the Royal Navy’s 101-gun steam first-rate Donegal, with the latter’s captain and a detachment of her crew on Shenandoah’s quarterdeck to watch the flag lowered. Captain Waddell of the Shenandoah would then have put off in a ship’s boat, probably in the direction of the present ferry terminal at the Pier Head, carrying a letter for the Prime Minister handing over the ship to Britain, which he gave to the Mayor of Liverpool at the Town Hall. When I introduced Davies’ article in this post, I was intrigued by the thought of what an observer at Bidston Lighthouse would have seen of the CSS Alabama’s sea trials in Liverpool Bay, and whether any telegrams from Thomas Dudley, the U.S. Consul at Liverpool, would have gone through the new electric telegraph station at Bidston in a final attempt to foil the Alabama’s escape. Since then, I have learned (thanks to Maurice Rigby), that there is an even more fascinating connection between the Alabama’s end and the people of Bidston Lighthouse and Telegraph Station. I am not referring to the fact that Cherbourg Harbour, the scene of the final showdown between the Alabama and the Kearsarge in 1864, was designed by Joseph Cachin, the same French engineer who drew this delightful illustration of Bidston Lighthouse in 1785. No, what fascinates me is the identity of the Able Seaman who rescued the Alabama’s Captain, Raphael Semmes, from the sea after the Battle of Cherbourg. His name was Henry Adams, and he was the son of James Adams, Bidston’s Telegraph Keeper. The Battle of the Kearsarge and the Alabama, Edouard Manet, oil on canvas, 1864, from Wikimedia Commons. The original is currently held in the Philadelphia Museum of Art. When Henry Adams died in 1909, newspapers far afield ran his obituary. This is what the Aberdeen Journal reported on 20 March, 1909. The death of Mr Henry Adams, which has occurred at Liverpool, recalls one of the most notable naval engagements of the nineteenth century. Mr Adams was mate on the yacht Deerhound which was present at the fight between the U.S. warship Kearsage and the Confederate cruiser Alabama off Cherbourg on 19th June, 1864. 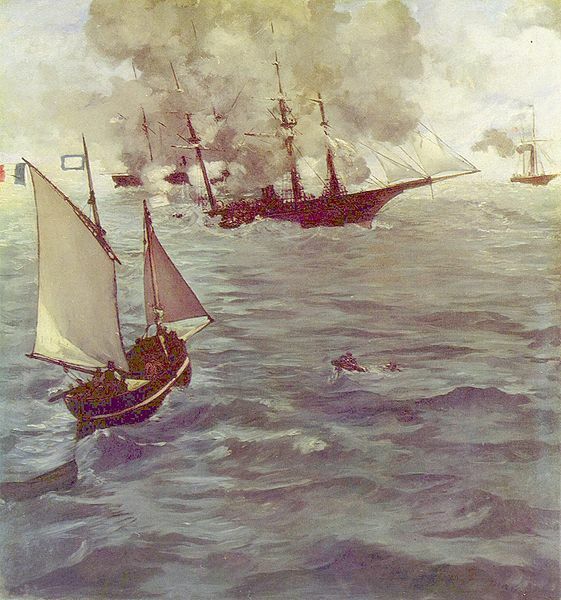 After doing enormous damage to the shipping of the northern states – for which Great Britain had subsequently to pay – the Alabama was cornered in the Channel, and Captain Semmes decided to give battle. The result was decisive, and when the Alabama, wrecked by the guns of the better-protected Kearsage, was sinking, Captain Semmes and some of her crew were rescued by a boat from the Deerhound commanded by Mr Adams. The captain of the Kearsage demanded that they should be given up, but Adams, wrapping a Union Jack round Semmes’s body, laid him at the bottom of the boat and defied anyone to remove him. For many years Mr Adams was employed by the Star Tug Company, of Liverpool, and he was both liked and respected in shipping circles on the Mersey. Henry Adams was born in 1840, in Penmon, Anglesey, probably on Puffin Island, where his father James was the Telegraph Keeper. On 8 April 1852, at the age of 12, he was appointed assistant telegrapher at Point Lynas, becoming the youngest employee in the telegraph service. He was replaced by Joseph Armitage on 11 August 1853, but took up the post again on 9 March 1854, following Joseph’s resignation. In the years that followed, he went to sea. Henry Adams joined the crew of the Deerhound in Birkenhead in April, 1864, having known the captain, Evan Parry Jones, since childhood. The Deerhound was a steam yacht, owned by Mr John Lancaster, of Wigan. It was in port in Cherbourg when word of the impending showdown between the Alabama and the Kearsarge reached them, and the Deerhound put to sea in time to observe the fight from a safe distance, out of gun range. When the crew of the battered and sinking Alabama abandoned ship, Adams took charge of the Deerhound’s gig and rescued many of the Alabama’s crew from the sea, including Captain Semmes. The Deerhound refused to surrender the Confederates to Captain Winslow of the Kearsarge. In the years that followed, the U.S. sought compensation from Britain for the damage caused by the Alabama, and the testimony of Adams and others was an important part of the proceedings. Presumably, Adams’ experience giving evidence in the protracted Alabama claims stood him in good stead, for he gained employment as a solicitor for a steam tug company, and went on to become the manager. Henry married Margaret Pryce, née Savage, the widow of Thomas Hargreaves Pryce, at St John the Baptist, Toxteth Park on 5 July 1870. Margaret and Henry appear not to have had any children. They lived for a while in Liverpool, before moving across the Mersey to Seacombe. Henry died on 16 March 1909, leaving an estate valued at £128 to his widow, Margaret. James Adams, Henry’s father, was born about 1807 in Kilkhampton, Cornwall. He married Esther Jones in 1837, in Penmon. James and Esther had at least eight children together, from Ann (1839), Henry (1840) to Esther (1861). James was Keeper of Puffin Island Telegraph Station from 1838-1852, then Point Lynas (15 Jan 1852-1856), returning to Puffin Island until its closure in 1960. When the electric telegraph replaced the semaphore telegraph, there was no longer a need for a station at Puffin Island, and James was pensioned off, only to be re-employed at the new electric telegraph at Bidston later in 1861. On 7 Apr 1861, the night of the census, he was living at Telegraph House, in Penmon, a pensioner. He was Keeper of Bidston Telegraph Station from 1861 to 1869, and was probably on duty when the Alabama set sail from Liverpool Bay on 29th July 1862. He became Keeper of Bidston Lighthouse in 1869, following the death of Ann Urmson. He was in charge while the new Bidston Lighthouse was being built in 1872-3. He retired to Beaumaris in 1879. Thanks to Maurice Rigby, for pointing out the connection between Bidston Lighthouse and Henry Adams, the saviour of Captain Semmes. UK People in the Civil War, article by Maurice Rigby, on the American Civil War Round Table (UK) website. Ménage-a-trois – the Deerhound Story, article by Greg Bayne, ibid. Correspondence Concerning Claims Against Great Britain: Transmitted to the Senate of the United States, in Answer to the Resolutions of December 4 and 10, 1867, and of May 27, 1868, page 281 and following, on the Mocavo website. An Englishman’s View of the Battle between the Alabama and the Kearsarge, by Frederick Milnes Edge, London, 1864, on the Project Gutenberg website. “Faster Than the Wind: A History of and a Guide to the Liverpool to Holyhead Telegraph”, by Frank Large, 1998. This entry was posted in Bidston Hill, History, Lighthouse, News and tagged AmericanCivilWar, BidstonLighthouse, Cherbourg, CSS-Alabama, CSS-Shenandoah, Deerhound, History, Kearsarge, Liverpool, telegraph on 6th November 2015 by admin.